The motion for this preliminary injunction was filed in February. 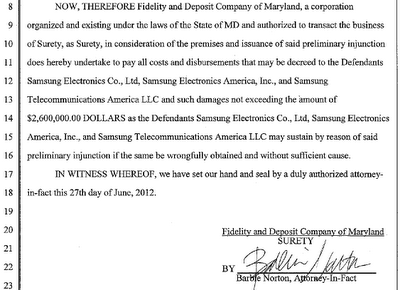 Samsung filed its defenses in April. The ruling is a huge win for Apple as well as Morrison & Foerster and Gibson Dunn, the law firms working on this part of the litigation. Apple and its lawyers convinced Judge Koh that the Galaxy Nexus likely infringes all four of the patents asserted in the preliminary injunction motion, and that all four of them are likely valid. But in the United States, injunctive relief is granted only if monetary damages are insufficient to make the right holder whole, and if other requirements are met. Courts apply the four-factor eBay v. MercExchange test. Apple's motion passed that test with respect to the "Siri patent", a patent on unified search. It must be a huge disappointment for Google to lose this lawsuit over a search patent. With respect to the other three patents at issue in this context -- slide-to-unlock, data tapping and autocorrect --, Judge Koh was not convinced that those features drive consumer demand and that Samsung's likely infringement causes irreparable harm. But Apple can still win an injunction when this case goes to trial, and even if it couldn't prove an entitlement to injunctive relief over those patents at that stage, Samsung would be liable for significant damages. In order for the injunction to take effect, Apple has to post a bond in the amount of $96 million ($95,637,141.60 to be precise), which is exactly the amount that Samsung demanded. There's no question that Apple will post this bond in no time, and that Samsung will appeal and move for a stay. Apple is now probably going to think about requesting a preliminary injunction against the Galaxy S III smartphone. Earlier this month, Apple wanted to add that device as a second accused product to this process. There were two patents with respect to which Apple believed Samsung's infringement had the same pattern, and the '604 Siri patent was one of them. If Apple moved for a preliminary injunction against the S III now over the Siri patent, it would be very likely to win, but it would have to accept a postponement of the trial of its first lawsuit against Samsung. This is a tough choice to make, but a motion over only one patent wouldn't necessarily cause a huge delay. Apple is on an incredible winning streak these days against Android. Earlier this week, it won a preliminary injunction against the Galaxy Tab 10.1. 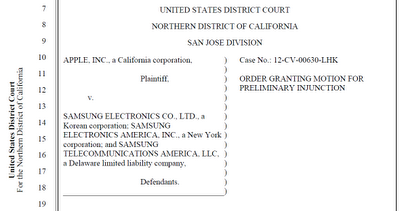 Today it was also cleared, by summary judgment, of infringement of one of Samsung's patents-in-suit. And on Friday, it won, by an unusually wide margin, a battle over expert reports. Even Judge Posner's ruling was, on the bottom line, far better for Apple than for Google. The problem is just that there are too many people commenting on these issues without understanding them, or with an anti-IP bias. 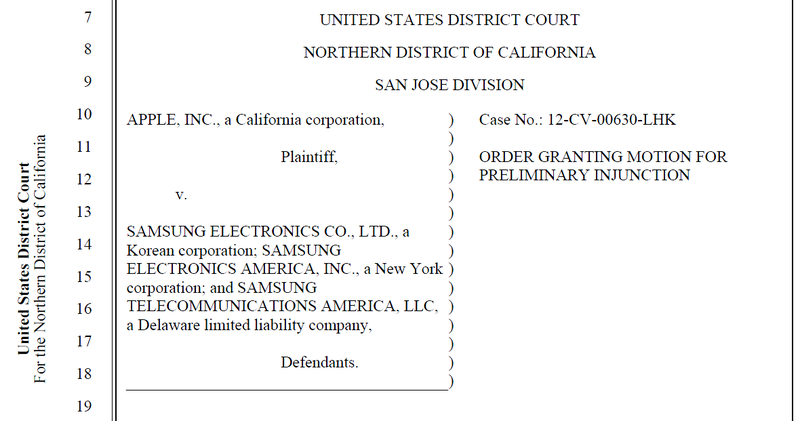 As I explained in a previous post, "the decision on Apple's claims was very specific not only to the four patents at issue at that stage of the litigation but also to the course of events in that litigation (as I pointed out in my detailed analysis)", as evidenced by the fact that Apple has meanwhile won two preliminary injunctions against Samsung, while "Judge Posner's position on FRAND is universally-applicable, and it will be extremely influential, throughout and beyond the United States", to Google's (Motorola's) dismay. "In sum, Apple has shown that claims 6 and 19 of the '604 [Siri] Patent are likely both valid and infringed. Apple has therefore shown a likelihood of prevailing on the merits of the '604 Patent." "In sum, Apple has shown a likelihood of establishing both infringement and validity." "Accordingly, Apple has shown a likelihood of success on the merits of its '647 [data tapping] Patent claim." "Accordingly, Apple has met its burden of establishing that the '721 [slide-to-unlock] Patent is likely infringed by the Galaxy Nexus, and that the '721 Patent will likely withstand a validity challenge at trial." "Accordingly, Apple has shown that it is likely to succeed on the merits at trial in its claims that the Samsung Galaxy Nexus infringes claims 18, 19, and 27 of the '172 [autocorrect] Patent." "The Court finds that the full extent of these losses would likely be unascertainable, difficult to calculate, and irreparable." "The Court is persuaded by the evidence in the record that the ’604 unified search functionality drives consumer demand in a way that affects substantial market share. Even accepting Samsung's argument that the intelligent voice-recognition aspect of Siri, as advertised, also contributes to consumer interest in the iPhone 4S, Apple has shown that the '604 Patented feature is core to Siri's functionality and is thus a but-for driver of demand for Siri. Accordingly, the Court finds that Apple has adequately established the requisite causal nexus between Samsung's alleged infringement of the '604 Patent and Apple’s risk of suffering irreparable harm." "Another focus of the FTC probe, the person said, is Google's decision to continue litigation started by Motorola Mobility over industry-standard patents after Google bought the company." In my opinion, Google's seamless continuation of Motorola Mobility's FRAND abuse comes as little surprise in light of the statement Google sent to standard-setting organizations earlier this year in connection with the Motorola deal. It was a pretty clear indication of Google's intentions. No matter how hard I try, I can't see a point in Google's decision to continue the pursuit of a litigation strategy that is not going to succeed, but adds to its antitrust worries. Google is already being investigated by the FTC and the European Commission over its conduct in the search business. In the United States, Google's leveraging of Android to cement its dominant market position in search has become a key antitrust concern. Now Google is separately being investigated by the same two competition authorities over its abuse of SEPs. The EU launched two formal investigations over that particular issue in April. Google had this coming. Earlier this month, the FTC wrote to the ITC to discourage import bans over SEPs in two investigations that were instituted at Motorola's request. In its first footnote, the FTC statement clarified that it did "not address whether seeking an injunction or exclusion order for RAND-encumbered SEPs would violate Section 5 of the Federal Trade Commission Act, 15 U.S.C. § 45, or Sections 1 or 2 of the Sherman Act. 15 U.S.C. §§ 1-2", but I think the FTC's intervention in and of itself should have drawn Google's attention to the writing on the wall. U.S. lawmakers are profoundly concerned. 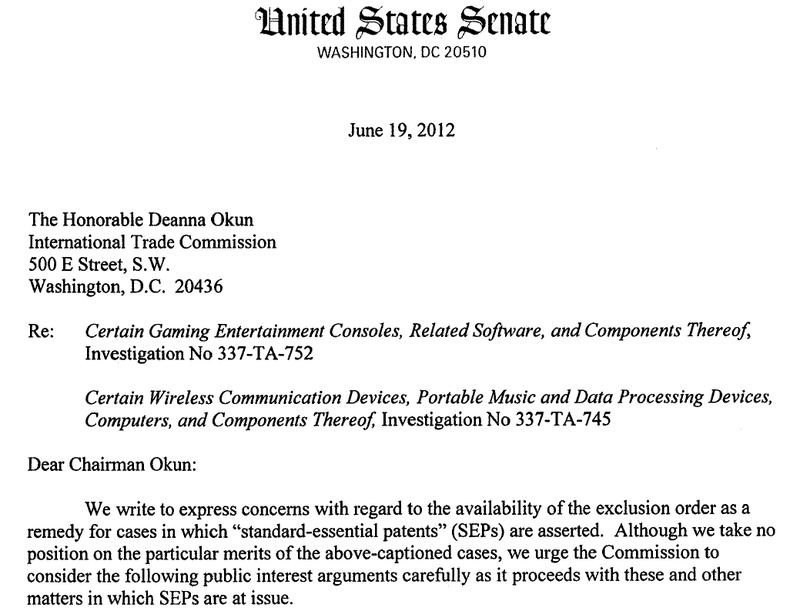 Yesterday I reported on a letter that six Republican senators, led by the Chairman of the Antitrust Subcommittee, sent to the ITC. Previously, Members of Congress from both sides of the aisle filed letters that I published a couple of weeks ago. In addition, a number of major industry players, most of whom have no involvement of any kind in the ongoing "smartphone patent wars", made submissions on the public interest. With investigations on both sides of the Atlantic underway, the noose is tightening and Google should withdraw its abusive requests for import bans and injunctions in the U.S. and Germany. Google has every right to defend Android. It even owes this to the Android ecosystem. But it has to do so without violating competition laws. This week Google demoed its new Nexus 7 tablet computer, which is set to compete with the iPad as well as other Android-based devices such as the Kindle Fire. The $199 price appears aggressive, and the jury is out on whether Google will be able to sustain that price or have to raise it once it has cleared all of the necessary patent rights. They certainly don't have a license from Apple. Given that Google is using its newly-acquired subsidiary Motorola Mobility to pursue import bans and other forms of injunctive relief against Apple, and considering that Apple requested a preliminary injunction against a device co-developed by Google, the Galaxy Nexus smartphone (Judge Koh's decision could come down anytime now), there's no reason why Apple would have to treat the Nexus 7 differently than, for example, the Galaxy Tab 10.1 (against which it just won a preliminary injunction). At this point I don't know whether the Nexus 7 is licensed by Microsoft. There certainly isn't a direct license agreement between Microsoft and Google -- otherwise there wouldn't be litigation between Microsoft and Google subsidiary Motorola Mobility. But Microsoft has deals with several major ODMs (Original Device Manufacturers) in place, such as Pegatron, whose shareholders include ASUS, Google's partner for the Nexus 7. If Microsoft's license agreement with Pegatron covers the Nexus 7, then we already have the third instance in which Google recognizes the need to pay patent royalties to Microsoft on Android-based devices (the other two instances are the Galaxy Nexus, given that Samsung signed a license agreement with Microsoft, and Motorola's recent PR stunt of a "settlement" proposal). If the Nexus 7 is not licensed through Pegasus or another ODM, then I believe it's in Google's best interest to negotiate a license sooner rather than later. The third major player to assert patents against Android devices in court is Nokia. It's suing HTC and ViewSonic. In a recent reaction to a Google EU antitrust complaint, Nokia said that it "has an active licensing program with more than 40 licensees". Nokia is particularly interesting in the Nexus 7 context because it's known to hold, besides a huge number of other (mostly non-standard-essential) patents, some patents essential to the IEEE 802.11 (WiFi, or WLAN) standard. I know because it's asserting a couple of such patents against ViewSonic in Germany. "Neither Asus [n]or Google is licensed under our patent portfolio." Through its recent lawsuits against HTC, ViewSonic and RIM, Nokia has shown that it means business when it comes to patent licensing. Nokia is such a large patent holder in this industry that even Apple took a royalty-bearing license. But Google and ASUS are not among the "more than 40 licensees" Nokia referred to in a recent press release. I don't know how much Nokia asks for, but since Nokia has so many licensees, there's every indication that its royalty demands are reasonably acceptable. Another thing I don't know is whether Nokia has previously contacted ASUS about patent licensing, but companies with a significant outbound licensing business, such as Nokia, routinely approach significant infringers and propose to negotiate a license agreement. I venture to guess that ASUS is more than large enough to be on Nokia's radar. It looks like Google and ASUS still have some homework to do. I previously mentioned "letters from six senators, led by Senators Herb Kohl (Chairman of the Subcommittee on Antitrust, Competition Policy and Consumer Rights) and Mike Lee (Ranking Member of the same subcommittee)". PoliticoPro had reported on it, but made the letter available to paying subscribers only. Today the letter (dated June 19, 2012) also showed up on the ITC document server. The antitrust-savvy signatories are, besides Chairman Herb Kohl (a Democrat from Wisconsin) and Ranking Member Mike Lee (Utah), Senators Jon Kyl (Arizona; notably, the Republican Whip), John Cornyn (Texas), Jim Risch (Idaho), and John Hoeven (North Dakota). All of these senators, except for Senator Kohl, are Republicans. You can find the full text of the letter further below. As you can see in the header shown further above, it was filed in the investigations of both Google/Motorola complaints (the one against Apple as well as the one against Microsoft). Meanwhile, the ITC has already commenced a thorough review of the preliminary ruling on Motorola's complaint against Apple, and FRAND issues receive a lot of attention based on the review questions. 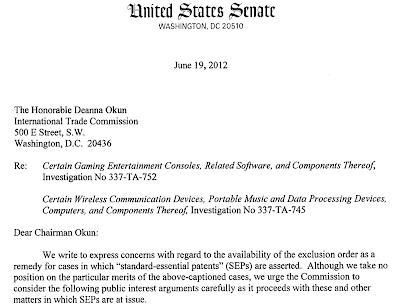 The ITC is still working on its decision on a review of the initial determination in the Xbox case. Google/Motorola just argued that the ITC shouldn't pay attention to Judge Posner's recent ruling. We write to express concerns with regard to the availability of the exclusion order as a remedy for cases in which "stanard-essential patents" (SEPs) are asserted. Although we take no position on the particular merits of the above-captioned cases, we urge the Commission to consider the following public interest arguments carefully as it proceeds with these and other matters in which SEPs are at issue. Business and consumers depend on a reliable standards-setting process to promote interoperability and expand choice. Industry standards underpin many of the technologies incorporated in common products used to play online video, connected to the Internet, watch DVDs, or communicate via smartphone. These standards are crucial to ensuring that consumers have access to a competitive market of compatible products. Many companies that participate in setting industry standards contribute patented technology to the standardization process. As a result, standard-essential patents are inevitably infringed when the standard is implemented. The standards setting process thus depends on a commitment from companies contributing patents to license those patents to all parties implementing the standard on reasonable and non-discriminatory (RAND) terms. For the standards setting process to function effectively, companies that commit to license their SEPs on RAND terms must seek to resolve disputes over patents through a royalty agreement or judicial determination of a reasonable rate. As these companies have pledged not to exercise exclusivity over such patents, they should not expect the grant of an exclusion order when they are in violation of an obligation to license the patents on RAND terms. Any precedent that would enable or encourage companies to include their patented technology in a standard, commit to license included patents on RAND terms, and then seek to secure an exclusion order despite a breach of that commitment would thus implicate significant policy concerns. Such an outcome would severely undermine broad participation in the standards-setting process, which would in turn threaten the meaningful benefits these standars provide for both industries and consumers. Given the value and importance of industry standards, we trust that you will carefully consider and give due weight to these critical public policy concerns in your analysis. Please keep us advised as your decision making process proceeds. On Monday, Microsoft pointed the ITC to the FRAND part of Judge Posner's dismissal of Apple v. Motorola. On Wednesday, Google subsidiary Motorola Mobility filed a letter with the ITC, in the Xbox case, that just entered the public record. The letter refers to Judge Posner's ruling as "a recent non-final, non-binding district court decision" and basically (though obviously not literally) tells the ITC: "Move on. Nothing to see here." After Microsoft had filed its request for judicial notice, but still on the same day (Monday), the ITC postponed the target date for its decision on the scope of the review of the preliminary ruling on the Xbox by one week. Google/Motorola is presumably concerned that this postponement is more than a mere delay of the crafting of the review questions: at the time of the review notice, certain claims could be dismissed. And that concern may have led Google/Motorola to file a letter denying the relevance of Judge Posner's ruling to the FRAND issues at the heart of the Xbox investigation. "This decision does not support Microsoft's [F]RAND defenses in this section 337 action, however. It is instead directed to the availability of an injunction in federal district court under eBay Inc. v. MercExchange LLC, 547 U.S. 388 (2006), not the Commission's statutory authority under 19 U.S.C. § 1337 to issue an exclusion order. It has elsewhere been expressly decided that eBay does not apply to Commission remedy determinations under section 337. See Spansion, Inc. v. Int'l Trade Comm'n, 629 F.3d 1331, 1359 (Fed. Cir. 2010)." The holding in Spansion was merely that the ITC is not required to adopt the eBay test. But there's nothing in that Supreme Court decision that would prevent the ITC from applying it if and when it so elected. In a recent post I mentioned that there are lawmakers and scholars who would like the ITC to give serious consideration to adopting eBay (or maybe parts of it). And the ITC itself clearly keeps that option open. The review notice issued on Monday in the Motorola-Apple case includes eight FRAND-related questions, seven of which (questions 7-13) contain the term "equity", and two other questions (questions 4 and 5) that don't mention the term but are definitely consistent with what could be, at least in part, an eBay-esque approach. I published the whole FRAND passage of Judge Posner's ruling, and while Judge Posner makes reference to eBay in his overall denial of injunctive relief in the Apple v. Motorola case, you can read the original text in that blog post and you'll see that Judge Posner's position on FRAND is entirely independent from the four eBay factors: it's a general competition/antitrust and common sense kind of argument. Even the paragraph that starts with the term "Injunctive Relief" stands on its own and doesn't depend in any way on eBay or rely on its four-factor analysis. In a different paragraph of its letter to the ITC, Google claims that import bans "must be" the consequence of a finding of a violation "because, in the absence of the availability of exclusion order, implementers have little incentive to negotiate in good faith towards the completion of a license on [F]RAND terms". Motorola told the same kind of thing to Judge Posner, who rejected that argument. The Mannheim Regional Court concurred with it, but Germany is, I regret to say, a unique jurisdiction in that regard. Google/Motorola will make more efforts to downplay the importance of Judge Posner's ruling. Microsoft also submitted Judge Posner's decision to the United States District Court for the Western District of Washington, where it has a summary judgment motion on Motorola's request for injunctive relief pending. In that case, there is no ITC-specific argument: Motorola can just say that a district court decision from a different circuit (7th Circuit) shouldn't matter in Seattle (9th Circuit) -- but Judge Posner's FRAND thinking will be taken very seriously there, I'm sure. The fact that Google-Motorola argues against the significance of Judge Posner's ruling, implicitly announcing an appeal and belittling it as a "non-binding district court decision" (Judge Posner, a circuit judge who usually only hears apeals, was sitting "by designation" on a district court for that particular case), shows that some people made a mistake (or purposely wanted to mislead) by portraying the ruling as a defeat only, or mostly, for Apple. Apple wanted a better outcome, but the decision on Apple's claims was very specific not only to the four patents at issue at that stage of the litigation but also to the course of events in that litigation (as I pointed out in my detailed analysis). As a matter of fact, Apple just won a preliminary injunction against Samsung, which shows that Apple can still succeed in court post-Chicago. By contrast, Judge Posner's position on FRAND is universally-applicable, and it will be extremely influential, throughout and beyond the United States (including, of course, the ITC). And that's what has Google/Motorola worried. These days, when companies announce a restructuring (or the exploration of "strategic alternatives") with respect to their patent portfolios, it usually means that someone hopes to sell out or to ratchet up monetization. Today, Qualcomm announced a restructuring that is simply a precautionary measure. Qualcomm keeps almost all of its patents in the existing parent company but spins off research and development. Qualcomm forms "a new wholly owned subsidiary, Qualcomm Technologies, Inc. (QTI), which, along with its subsidiaries, will operate substantially all of Qualcomm’s research and development activities, as well as product and services businesses, including its semiconductor business, QCT". This is because "the company expects that QTI and its subsidiaries' product and services businesses will increase their work with open source software in the future and this restructuring will, among other things, help ensure that QTI and its subsidiaries’ activities do not result in the licensing of any of Qualcomm Incorporated's patents, including its 3G and 4G patents". What does this mean? Qualcomm knows that its patents are the crown jewels of the company and is concerned that it could lose its ability to enforce some of those crown jewels against third parties just because of the patent-related pitfalls involved with open source licensing. This would adversely affect Qualcomm's licensing business and its shareholder value. Open source licensing is a tricky thing. At first sight, many people are led to believe that such licenses as the GPL, the Apache license or the various BSD-style licenses are straightforward and have no significant downside. But those who contribute to open source projects or redistribute software under open source licenses may indeed restrict their ability to enforce patent rights against others. Open source licenses are primarily copyright licenses, but some contain clauses on patents and even those that don't mention patents at all can be construed to constitute a grant of an implicit patent license. Open source software is free, and for a company like Qualcomm it would be devastasting if some of its patents could be used on a royalty-free and largely or entirely restriction-free basis just by incorporating certain open source code with which Qualcomm is involved (as a contributor and/or redistributor) into third-party products. BSD-style licenses are very short and usually don't mention patents explicitly. The GPLv2 (the license under which Linux, MySQL and many other open source programs are published, though it's less popular now than it used to be) makes some references to patents but lacks clarity in this area. That's why the GPLv3 was primarily created in order to make up for the GPLv2's patent-related shortcomings, but GPLv3 is ideologically-charged and much less popular. The Apache Software License also makes explicit reference to patents but is more palatable to commercial players than GPLv3. Still, the philosophy behind open source licenses is usually hostile to patents. For a large organization like Qualcomm, it's very difficult to manage the use of open source licenses on a company-wide basis. If you have an engineer somewhere who isn't aware of the legal issues involved but contributes some code to an open source project, or incorporates open source software into some Qualcomm technology, the impact on Qualcomm's patents could be far-reaching -- and the company might not know it until it sues someone over a patent and suddenly faces a license-related defense. It's impossible to have a lawyer look over every engineer's shoulder all the time. Qualcomm was apparently aware of these risks and opted for a new corporate structure under which it can counter any license-based defense by pointing to the fact that a subsidiary cannot license out its parent company's patents. The effort of restructuring a company of Qualcomm's size is very significant. The fact that Qualcomm undertook this effort shows how protective its management is of its patents and how profound its concern over the implications of open source licenses must have been. The organizations behind certain popular open source licenses, such as the Free Software Foundation (GPL) or the Apache Software Foundation, will probably look closely at what Qualcomm is doing and discuss internally whether Qualcomm's restructring is a blueprint for all those who seek to circumvent the patent clauses of open source licenses in a way that runs counter to the spirit of those licenses or, even worse, renders the patent clauses of those licenses ineffectual. There will probably be some lively debate on certain internal (or even public) mailing lists. And many other companies that make use of and/or contribute to open source software will also think about whether their corporate structure poses a risk to the enforceability of their patent rights. The United States District Court for the Northern District of California just became the third court to order a preliminary injunction against the Samsung Galaxy Tab 10.1, and the second, after the Düsseldorf Regional Court, to do so over an iPad design patent (an Australian injunction, which was subsequently lifted, was based on two technical patents). Judge Lucy Koh entered the injunction at close of business on Tuesday. Only a day earlier she had scheduled a hearing for Friday. Her order explains that "further briefing and argument from the parties on the issue of the preliminary injunction is unnecessary". Given the Federal Circuit's appellate ruling and her original decision to deny an injunction (which was based on the assumption, overturned on appeal, that the design patent was likely invalid, but nevertheless stated that there was an infringement and irreparable harm), she felt that "any further delay of the injunction is not justified". The injunction will enter into effect as soon as Apple posts a $2.6 million bond. 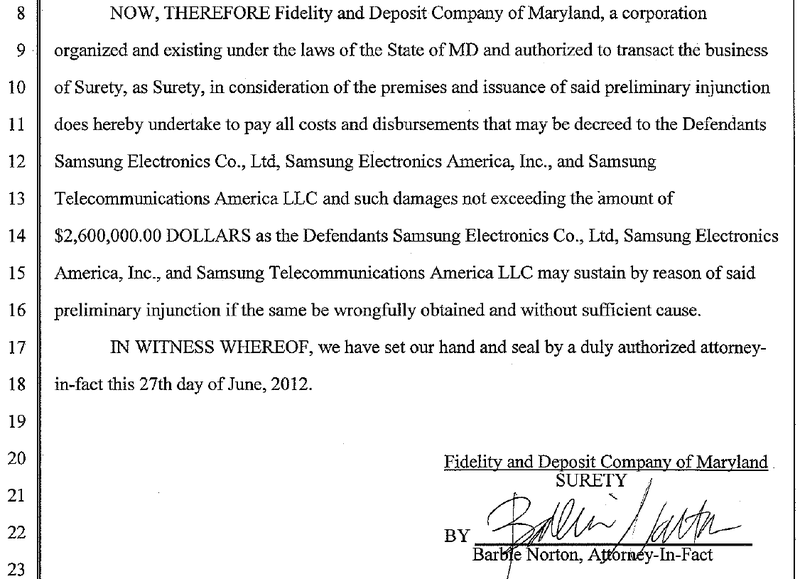 NOTICE IS HEREBY GIVEN that Defendants Samsung Electronics Co. Ltd., Samsung Electronics America, Inc., and Samsung Telecommunications America, LLC appeal to the United States Court of Appeals for the Federal Circuit from the June 26, 2012 Order Granting Preliminary Injunction entered in the above-captioned action, Docket No. 1135, and each and every part thereof. The decision strengthens Apple's "copycat" allegations against Samsung. The ruling notes that Judge Koh's court "previously found the Galaxy Tab 10.1 to be substantially similar 'in the eyes of the ordinary observer' to the D'889" and that "the Galaxy Tab 10.1 is 'virtually indistinguishable' from Apple's iPad and iPad 2". In fact, Samsung's counsel couldn't distinguish those products when Judge Koh showed them in the courtroom at a limited distance. If Apple also prevails on this infringement issue at the upcoming trial (which is scheduled to begin on July 30), Samsung may be liable for a substantial amount of damages. Design patent infringement can be very costly. Samsung is still going to be able to sell 10.1-inch tablet computers in the United States. The scope of a design patent is relatively narrow (which makes it all the more embarrassing for Samsung that it infringed one at all), so Samsung can design around it, as it did in Germany, where a motion for a preliminary injunction against the Galaxy Tab 10.1N (the redesigned version) was denied. At this stage of the lifecycle of the Galaxy Tab 10.1, it's possible that Samsung decides to just take it from the market and focus on new product launches. But if it wanted to continue to sell it in the United States for some more time, it would simply redesign. A redesign might lead to another push by Apple for an injunction, but that's the best way for both parties to get clarity on the scope of Apple's design patent. Disputes over design patents are usually not settled by way of a long-term license agreement. Patent cross-license agreements typically exclude design patents, just like companies wouldn't cross-license all of their trademarks. Design patent disputes can just be settled case by case (for example, with the alleged infringer agreeing to make certain modifications). Apple's enforcement of U.S. design patents and equivalent design rights in other jurisdictions already appears to have resulted in different design decisions on Samsung's parts. Its newer products, such as the Galaxy S III smartphone, are clearly more distinguishable from Apple's offerings. Samsung saw that it was just going to suffer all sorts of disruptions of its business, and negative publicity, by continuing to copy Apple's designs. And the commercial impact of injunctions is much greater if they come down shortly after the launch of a product. Judge Koh will soon adjudicate another motion for a preliminary injunction against Samsung: the one targeting the Galaxy Nexus smartphone with four technical patents. A hearing on that motion was held earlier this month. That decision will be much more important since the software patents at issue in that case are potentially much broader than the iPad design patent and allegedly cover techniques that are found in many other products (other Samsung products as well as third-party products). A few hours prior to the Galaxy Tab 10.1 decision, Samsung's hard-working and imaginative lawyers made a last-ditch attempt to cause a delay. They brought a motion (already the second one in as many months) to introduce new evidence. They argued that the factual record on which Judge Koh originally denied a preliminary injunction in December 2011 was outdated by now, and tried to inject new prior art and arguments related to an iPad 2 prototype Apple presented to the patent office. Judge Koh denied this 11th-hour motion in a footnote. "This Court is persuaded by Judge O'Malley's concurrence that the public interest favors an injunction here 'because the record at this stage shows that the D'889 Patent is likely valid and infringed, and there are no other relevant concerns, the public interest is best served by granting a preliminary injunction.'" Circuit Judge O'Malley concurred with her colleagues in all respects but wanted the Federal Circuit to go one step further and order an immediate entry of a preliminary injunction. Her colleagues, however, believed that the first-line court, the district court, should perform the equitable analysis and said that this could happen quickly. Samsung's multiple efforts to delay the district court's decision on remand show that Judge O'Malley's concern about potential delay was not unfounded. Getting a denial of a preliminary injunction overturned, even if only to a limited degree, was a significant achievement for Apple's lawyers at the Federal Circuit. It's easier to succeed with appeals of final rulings. More and more smartphone patent cases are appealed to the Federal Circuit, and if statistics are any indication, we will see more cases in which district court and ITC decisions clearing Android devices of certain infringements will be modified. This was just the first case in which it produced a result that impacts the market, but it won't be the last. Yesterday, Apple filed a motion in the investigation of its second ITC complaint against HTC (the one filed last summer). The motion entered the public record today. Apple withdraws all asserted claims of one patent as well as 34 claims from the four patents remaining in the investigation. This is a pre-trial streamlining effort. The evidentiary hearing will take place in August. Prior to the latest motion, Apple had already dropped claims 15-19 and 21 of the '915 patent. At this stage, Apple is still asserting 31 claims of four patents. There will have to be some further narrowing before and/or during and/or shortly after trial. I have no doubt about Apple's willingness to narrow the scope of the investigation step by step. In the investigation of HTC's second complaint against Apple, some narrowing has already occurred (and been appealed) because five Google patents were thrown out by a judge. Also, Apple claims that HTC's assertion of two of the remaining three patents constitutes an abuse of standard-essential patents. The parties are furthermore embroiled in an enforcement dispute relating to the import ban the ITC ordered last December over the '647 "data tapping" patent. The latest filing was an HTC letter. Judge Lucy Koh has scheduled a preliminary injunction hearing concerning the Galaxy Tab 10.1 for Friday, June 29, 2012, as a follow-up to to the Federal Circuit's appellate decision. More detail below. Apple has dropped an iPhone user interface design patent as part of continuing efforts to narrow the case with a view to the upcoming trial. More detail below. The court is defending public access to filings against excessive sealing, pointing to Ninth Circuit law. For more detail on this one, I recommend Alison Frankel's article for Thomson Reuters News & Insight. At a summary judgment hearing last week (see this report by the IDG News Service), Judge Koh already scheduled a preliminary injunction hearing for Friday, June 29. A week ago I reported that a decision on Apple's post-appeal motion for a U.S. ban of the Galaxy Tab 10.1 over an iPad design patent was approaching after the Federal Circuit denied a Samsung request for a rehearing. Late on Monday, Judge Koh entered an order for the upcoming hearing, telling the parties that, at the hearing, they "may address the two issues identified in the limited remand order by the Federal Circuit: (1) whether the balance of the hardships favors issuing a preliminary injunction, and (2) whether the public interest favors issuing a preliminary injunction", but "[n]o further briefing or evidence will be permitted". The parties previously filed their related pleadings, so the court is already briefed. Apple brought its motion on May 18; Samsung responded a week later with a largely 4G-related argument, to which Apple replied on May 31 (see the first bullet point in this post). From the outset, Samsung argued that the district court would have to wait for the formal mandate from the Federal Circuit. Judge Koh nevertheless set the aforementioned, pretty expedited briefing schedule, but upon further consideration she canceled a June 7 hearing and denied Apple's motion as premature for the time being. In yesterday's filing, Judge Koh informs the parties that "the mandate from the Federal Circuit has been received and docketed by the Clerk" As a result, the ball is now, once again, in the district court. I believe Judge Koh will decide very quickly on this one, either right from the bench on Friday or shortly thereafter. She also has a preliminary injunction motion targeting the Galaxy Nexus smartphone to adjudicate, following a June 7 hearing. She said that an order would issue shortly, but I predicted that this was going to take more than just a few days, though not as long as the decision on last year's motion (which took almost three months after the related hearing). Last Wednesday, Apple gave notice of its "intent to dismiss claims concerning U.S. Patent No. D617,334, and a day later, Apple and Samsung filed a stipulation for the dismissal without prejudice (i.e., Apple could still enforce this patent against Samsung in another litigation) of this design patent. During the last two rounds of narrowing proposals, Apple had already dropped two other design patents and announced that it was going to withdraw at least one more design patent. It has now apparently selected the D334 patent for this purpose. From what I read about last week's hearing, Judge Koh keeps up the pressure with respect to narrowing. The parties will only get a limited amount of time and won't be allowed to file "thousands of documents", as Magistrate Judge Grewal informed them even ahead of Judge Koh's hearing. This means the parties will have to focus on their strongest arguments, and in order to do so, they may also decide to focus on even fewer intellectual property rights. Some pending summary judgment motions could also have a significant narrowing effect. Samsung still claims that Apple needs to drop more of its asserted rights. Apple definitely wants this case to go to trial on July 30. There might also be some narrowing with a view to the FRAND issues raised by most of Samsung's offensive counterclaims. Judge Posner has shown how a court can deal efficiently with assertions of standard-essential patents. But Judge Koh appears to be much less aggressive when it comes to narrowing a case. And that may also benefit Apple for its own claims (which don't raise FRAND issues). The ITC just announced a thorough review of a preliminary ruling on Google subsidiary Motorola Mobility's complaint against Apple. It also had a target date today for a decision on whether (and, if so, to what extent) to review a preliminary ruling on Motorola's complaint against Microsoft. But that decision was postponed by one week. It is now scheduled to be announced in one week from today, i.e., on Monday, July 2, 2012. In light of the focus of the questions the Commission's review notice raised in the Apple case, I have no doubt FRAND and injunctive relief issues will also play a major role in next week's notice. But the question of whether Microsoft waived its FRAND defense will hardly come up: Microsoft's FRAND defense was discussed in detail in the initial determination, which stated that "Motorola was not interested in good-faith negotiations and in extending a [F]RAND license" to Microsoft. Also, Microsoft had filed a lawsuit to enforce Motorola's FRAND licensing obligations even before Motorola brought this ITC complaint. That federal lawsuit will go to trial in November. On Friday, Microsoft filed a motion for a partial termination of the investigation. The content of the motion (85 pages including exhibits) is not publicly accessible, but chances are that it also has to do with FRAND. And today, Microsoft filed a request for judicial notice of the FRAND part of Judge Posner's Apple v. Motorola decision, which I said before is the best FRAND ruling I've ever seen. The ITC's announcement next week will be very interesting, I'm sure. The United States International Trade Commission just gave notice that it will review in part -- actually, in many parts -- a preliminary ruling that held Apple to infringe a wireless standard-essential patent (SEP) held by Google subsidiary Motorola Mobility. Based on the review notice, Apple now has a realistic chance of avoiding an import ban, but Motorola's own petition for review has also been granted in some respects. The good news for Apple is that the Commission, the six-member decision-making body at the top of the ITC, is going to look into a couple of questions affecting both the infringement and the (in)validity analysis concerning the patent that Administrative Law Judge Thomas Pender deemed valid and infringed. There is also a possibility of the Commission overruling Judge Pender with respect to Motorola's own use of that patent (only a patent holder who satisfies the domestic industry requirement can win an ITC exclusion order). 6. Has Apple waived its right to assert that Motorola failed to offer a license on reasonable and non-discriminatory (“RAND”) terms? In discussing this issue, please refer to Commission Investigative Staff Motion in Limine to Exclude The Expert Opinion of Jerry Hausman filed July 14, 2011, and to Respondent Apple Inc.’s Opposition to Commission Investigative Staff's Motion In Limine to Exclude the Expert Opinion of Robert O’Hara at page 1, n. 1 filed July 22, 2011. 7. If the record of an investigation lacks evidence sufficient to support a RAND-based affirmative defense (e.g., equitable estoppel, implied license, waiver, etc. ), under what circumstances (if any) should a RAND obligation nonetheless preclude issuance of an exclusion order? Please discuss theories in law, equity, and the public interest, and identify which (if any) of the 337(d)(1) public interest factors allegedly precludes issuance of such an order. 8. Does the mere existence of a RAND obligation preclude issuance of an exclusion order? Please discuss theories in law, equity, and the public interest, and identify which (if any) of the 337(d)(1) public interest factors allegedly precludes issuance of such an order. 10. Should a patent owner that has refused to offer a license on a RAND obligated patent to some entity (regardless of whether that entity is a named respondent in a Commission investigation) be able to obtain an exclusion order? Please discuss theories in law, equity, and the public interest, and identify which (if any) of the 337(d)(1) public interest factors allegedly precludes issuance of such an order. 11. Should a patent owner that has refused to negotiate a license on RAND terms with a named respondent in a Commission investigation be precluded from obtaining an exclusion order? Please discuss theories in law, equity, and the public interest, and identify which (if any) of the 337(d)(1) public interest factors allegedly precludes issuance of such an order. 12. Should a patent owner that has refused to negotiate a license on RAND terms with some entity (regardless of whether that entity is a named respondent in a Commission investigation) be precluded from obtaining an exclusion order? Please discuss theories in law, equity, and the public interest, and identify which (if any) of the 337(d)(1) public interest factors allegedly precludes issuance of such an order. 13. Should a patent owner who has offered a RAND license that the named respondent in a Commission investigation has rejected be precluded from obtaining an exclusion order? Please discuss theories in law, equity, and the public interest, and identify which (if any) of the 337(d)(1) public interest factors allegedly precludes issuance of such an order. 4. With regard to the ‘697 and ‘223 patents, are there substantial costs and delays associated with switching away from the standardized technology in question? 5. With regard to the ‘697 and ‘223 patents, do the patents in question cover relatively minor components of the accused products? These questions don't suggest what the decision will look like, but it's interesting that the ITC is now looking very closely at theories that could result in the denial of an exclusion order even if a violation is identified. In other words, the ITC is looking at the implications of injunctive relief more comprehensively, and it may increasingly base its analysis on at least some of the factors that federal courts consider under the eBay v. MercExchange test for patent injunctions. In connection with the investigations of Motorola's complaints against Microsoft and Apple, statements on the public interest have been filed, especially (though not exclusively) over FRAND issues, by major stakeholders, even including lawmakers (formally only in the Microsoft case, but with implications also for the Apple case). In the Apple case, the ITC's review notice acknowledges submissions from the following non-parties: Federal Trade Commission; Business Software Alliance; Association for Competitive Technology; Retail Industry Leaders Association; Verizon; Nokia Corporation; Hewlett-Packard Company; and Microsoft Corporation. And the Commission is now going to look very closely at the issues that have been raised. As I said before, eight of the 13 review questions relate to FRAND, and two more relate to equitable considerations that could stand in the way of the entry of an exclusion order. The ITC is also going to review some questions with respect to three Motorola patents that the ALJ did not deem violated. I have yet to analyze whether the scope of the review suggests that the final decision could, apart from FRAND and injunctive relief issues, be even more favorable to Motorola than the preliminary ruling, but at first sight I think there's at least one more patent on which Motorola could prevail. I will look at this more closely when the parties' answers to the Commission's questions become available.